This walk was rained out! After the driest summer in years, we got a good soaking on Saturday. We will reschedule Diana in the spring. Our October Nature Walk will be a bird watching walk with expert Diana Fruguglietti. We will take a walk, exploring the varied habitats of the Mary Cummings Estate. Meeting Place: Parking lot on Blanchard Rd in Burlington. 10:00 – noon. Diana spent her career working in the software industry as a Software Configuration Manager but in 2012 decided to pursue her true love of nature, animals, photography and travel. She has seen Mountain Gorillas in Uganda, Orangutans in Borneo, Tigers in India, Jaguars in Brazil, Penguins in Antarctica and most of the big animal species in Tanzania, South Africa, Uganda and Madagascar. Africa and Central and South America are her favorite areas to travel with Colombia being her favorite country. 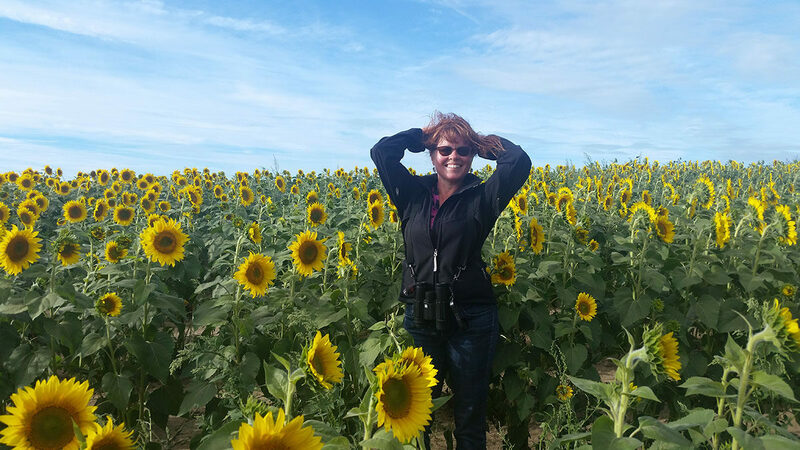 Diana has been birding since 2002 and is on a quest to see as many species as possible throughout the world. She loves to travel and has been fortunate to have visited 51 countries thus far and has been to all continents. In the last 2 years she has started organizing birding trips around the world. She prefers to hire local guides and has many contacts. If you would be interested in traveling with her, please email her at diana.fru@gmail.com. Her life list is 4159 species seen throughout the world of over 10,000 species and her ABA list is 694 species seen in the US and Canada. Diana is the Program Director for the Menotomy Bird Club and on the Board of Directors for the Brookline Bird Club and leads bird walks for both clubs as well as for WREN.